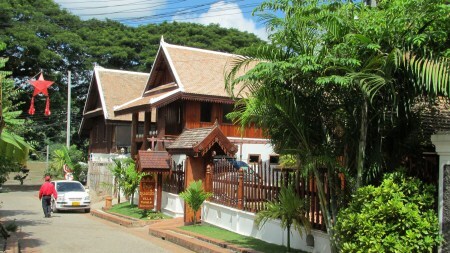 Finding a place to stay is quite easy in Luang Prabang. There are plenty of guest houses and hotels to suit all types of travelers. What ever your budget is, there is a place for you to stay and explore the beautiful World Heritage Town of Luang Prabang. When I was there in October-November of last year, I made a point to walk around and checked out several places. This one street, just a few meters from the Mekong River is full of guest houses and more being built like mushrooms growing left and right. Later, I found a few more guest houses along the Mekong River being built by Lao owners and offered a great discount prices (25-30 dollars) per night for their grand opening. This will surely put a dent to a few of the more well known guest houses, with prices starting over $100 on the same street, offering the same great view.